Emanating from the wild windswept snowfields of its source on Qinghai-Tibet Plateau, the mighty Yangtze winds its way through 11 provinces and municipalities before emptying into the East Sea . Being referred as the Long River for many generations, it has always had symbolic and practical significance for the Chinese. Nearly 6300 km (about 4000 miles), the river is China 's main artery, supporting a third of our people; it also serves as the country's major commercial waterway. The Upper Reaches begins from the source of Qinghai Province to Yichang in Hubei Province ( 4500km ). It is the most attractive part of the river, with imposing mountain ranges, unbroken ravines, dangerous rapids and charming landscape. Along this 200-kilometer-long (130 miles) stretch, the river passes through the Three Gorges. In the Qutang Gorge, the river is only 100 meters wide with some 60 meters (200 feet) hydraulic gradient. 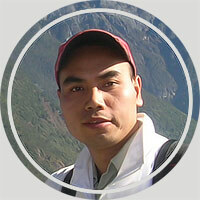 In the Wu Gorge, mountains rise to a height of 500 to 1,000 meters (1,600 to 3,300 feet). 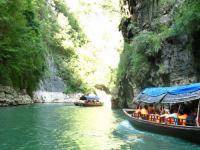 In Xiling Gorge, it was featured with turbulent waves and dangerous shoals. 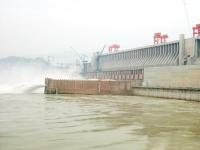 Now this has become a history after the completion of China's largest engineering project - the Yangtze Three Gorge Dam. The Middle Reaches is from Yichang to Hukou at the mouth of Poyang Lake in Jiangxi Province, a distance of about 1,000 kilometers (620 miles). This region features countless twists and turns, flat lands with so many tributaries and lakes including two largest lakes in China: the Dongting and the Poyang . During rainy season, the waters play an important role in channeling the flood. The Lower Reaches is from Hukou to the estuary ( 800km ). The landscape in the river's lower course is typified by a flat delta plain, crisscrossed by canals and waterways. The region has been known for centuries as the "Land of Fish and Rice". Because of a port named Yangzi in ancient times, this stretch has given rise to another name "Yangtze" with which missionaries and colonialists adopted and as a result, became established in Europe as the name of the whole river. Historic cities along the river: Chongqing, Yichang, Wuhan Yueyang, Jiujiang, Nanjing, Zhenjiang, Shanghai. Tourist attractions near the river: Leshan Giant Buddha & Emei Mountain, Taoist Qing Cheng Mountain, Jiuzhaigou, Three Gorges, Zhangjiajie, Jiuhuashan Mountain, Huangshan Mountain, Lushan Mountain, Tai Lake. Agricultural resource: Cultivated land in Yangtze River basin area covers 25% of that in China, grain production 40%, rice production 70%, cotton production 33% or more. Hydropower resource: exploitable power potential is 1.97 hundred million kw, annual power generation about 1,000 billion kwh which accounts for 53.4% of the country.